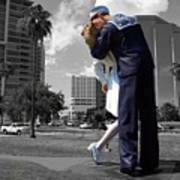 Sarasota Kiss is a photograph by Don Columbus which was uploaded on September 1st, 2018. 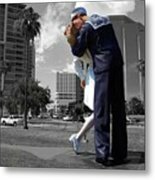 This 26 foot tall statue titled "Unconditional Surrender" by its sculptor John Stewart Johnson II who says he fashioned it after a photograph of the same name by Victor Jorgensen who was a Navy photojournalist whose picture made the cover of the New York Times the day after V-J Day ending the Second World War August 14, 1945. The statue does resemble Jorgensen's work, which resembles the iconic image and cover of Life Magazine Alfred Eisenstaedt took standing a few feet to the left of Victor at that same time. Ever stand next to a world famous photographer and take pictures? I think I would go with Life. So what can I say about my picture, it is a derivative of a work that is derivative work of a photograph. So it is Double Derivative. Thank you Judy for the Feature in "Whats New"!! I always loved this from the original photo. Can you imagine what would happen to the poor sailor that tried this nowadays? Fabulous capture. Thank you Bunny!! It is a much Different World today! Great use of selective color !! Nice work Don !! Thank you very much Aashish!!! Thank you Kay!! 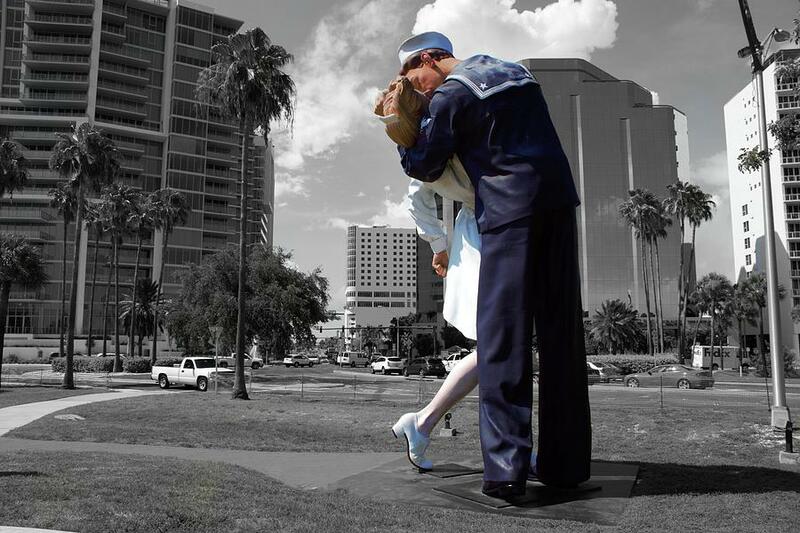 This statue has been in many cities on display, its owner donated to Sarasota as he lives there. Popular with tourists while not so popular among the artists in this community. I've taken photos of this same scene, but not with your eye. Very nice, Don! Thank you Ron for your very nice complement!! Thank you very much Jan for selecting my image "Sarasota Kiss" as a Feature of the week in "Creative Black and White Fine Arts Photographs"!!! Nice use of selective color, John Stewart Johnson ll is an amazing artist. We have a number of his works here, l/f. Thank you Steve!! The use of selective color and POV here was to make the subject appear even bigger in the image. Thank you very much Susan! !